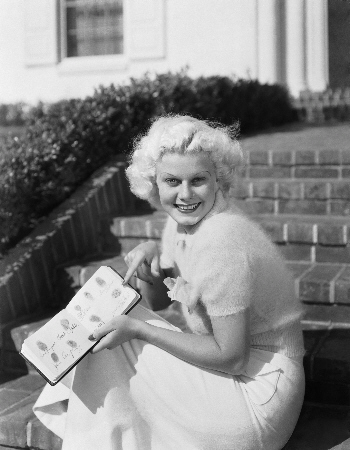 Canada's #1 Jean Harlow fan, my e-pal, Michel Portelance, kindly alerts us that Dr. Macro's High Quality Movie Scans, which has been MIA on the net recently, has resurfaced at a new URL: http://www.doctormacro.com. Those familiar with the good doctor's work will be glad to know that his new site still features several pages of gorgeous Harlow images, like this one, which I've scaled down from the original for faster loading here. I'd love to know what ever happened to the celebrity thumb-print "autograph" book she's holding, wouldn't you? Thanks, Michel, for staying on top of this story! And thanks, Dr. Macro, for sharing your lovely Harlow images with the public.